Getting started: If you haven’t fished for many years, or if you’re a first time angler anxious to get started fishing, walking down the aisles in a big retail store can be intimidating. There seem to be endless options when it comes to fishing tackle and it is almost impossible to know where to get started without spending a fortune. While there are countless ways to approach gearing up for your first trip to the lake, these 7 bits of essential gear will put you on the right path for bringing fish to the shore. If there’s one thing fishermen have in common it’s that we all love talking about fishing. A great way to learn where to fish is to find someone familiar with your area and talk to them. Learn the different species that live in the area you’d like to fish, the most effective baits and lures to use, and the general locations that are most productive. Just make sure you don’t ask for specific locations - anglers have spent countless hours learning the area and may not be willing to give up that valuable information. 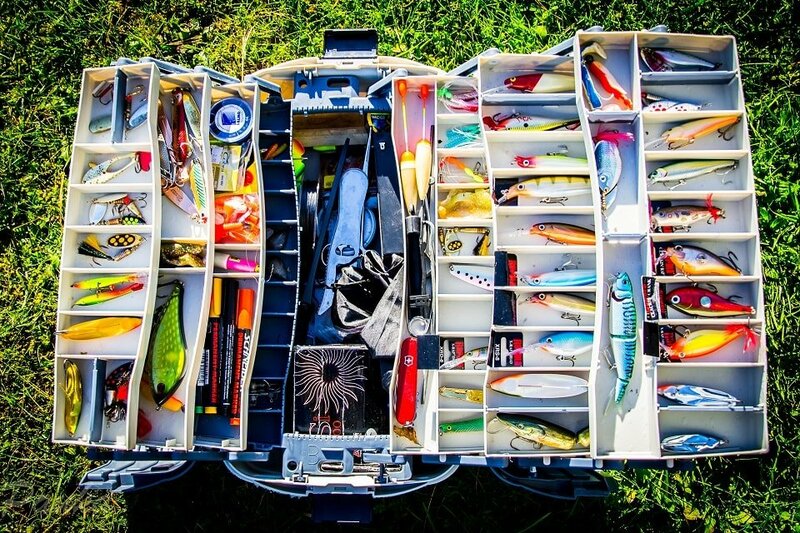 Like most other hobbies, you can go from mild to wild when it comes to selecting angling gear. There are specific rods and reels designed for every fishing style, but the key for first time anglers is to keep it simple. You’ll want to look for a rod & reel combo that you can use for both bait fishing and lure fishing. A medium action rod rated for 8lb to 20lb line will be a great start and give you the ability to catch many different species commonly found in lakes and rivers. The Ugly Stik GX2 model is a very reasonably priced, durable combo that will last many seasons with proper care. First time anglers should start with spinning reels (commonly called “open face” reels) before attempting to use baitcasting reels. Nowadays, fishing line is available in many different materials and diameters. Larger diameter lines are stronger than smaller diameter lines made of the same material. In general, braided lines are very strong and thin, fluorocarbon lines are typically abrasion resistant and almost invisible underwater, and monofilament lines are buoyant and will stretch. While there is a specific reason to use each of these line types, keep it simple when starting out and stick with monofilament. Berkley Trilene XL Smooth Casting clear monofilament in 10 lb test is a great line to get started with. Practice tying knots with the monofilament before your fishing trip as there's nothing more frustrating than forgetting how to retie a hook to your line while the fish are biting. A few important knots to learn at a minimum is the improved clinch, palomar and uni knots. Knowing these three knots will give you the skills to tie on practically anything you may need in freshwater fishing. There are only three different types of tackle that first time anglers might need: hooks, weights and floats. Weights are necessary to help provide more casting distance and keep your bait under water. For first time anglers, stick with basic split shot weights. They are inexpensive and easy to install. We’ll get into more specific detail regarding hooks in later sections, but for now, remember to purchase hooks that are not snelled. Snelled hooks have a leader pre-tied to them that the user then attaches to a swivel snap. Gamakatsu makes sharp, durable, long lasting hooks that are available in almost every tackle shop. Finally, there isn’t an angler out there that didn’t start fishing with a float. Often times called bobbers or strike indicators, floats help keep your bait off the bottom of the lake and provide a clear visual indication when a fish is eating your bait. Comal Tackle Company sells a wide variety of effective and inexpensive floats that are great for freshwater fishing. For most of us, our love of fishing started out with live bait. Possibly the most effective, universal live bait out there is the nightcrawler. Virtually every freshwater fish will eat nightcrawlers. For panfish like bluegills and perch, tie a small circle hook (size 8 or 10) to your line then add a few small split shots about 12 – 18” above the hook. Clip the float on the line above the split shot and then place small pieces of nightcrawler through the hook and cast the line a few feet off the bank. If there's panfish near, they'll eat the worm quickly. When you see the float go under water, start reeling in the line and chances are you'll have hooked a bluegill. The circle hooks will help prevent the fish from swallowing the hook. Take the float off and replace the small spilt shot with a few larger ones and tie on a larger hook (size 2 or 4). Thread on a whole nightcrawler, cast the line out and let it rest on the bottom to attract bottom feeders like catfish. Live shiners are an excellent bait for predatory fish like bass. Shiners are small baitfish that bass can’t resist. For hooking them, go back to the setup you used for panfish, but tie on the larger hook. Take a live shiner and hook it through the back and cast it gently. When your float goes under water when using shiners for bait, you can almost always be certain it was from a good sized fish. Eventually you may become bored with bait fishing and start looking for a new challenge. Then it’s time to start experimenting with lures. While there are countless lure styles, colors and manufacturers, we’ll focus here on common lures that will have a high success rate for first time anglers. When it comes to bass fishing, one of the most popular artificial baits is the Yamamoto senko. A 5″ green pumpkin colored senko wacky rigged can be deadly on largemouth bass in lakes or ponds. Another great soft plastic bait is the swim shad made by Keitech. Tie on a 1/8″ ounce ball jig head and run the hook through the head of the bait. Cast it out, let it sink to the bottom and retrieve it. Practice with different retrieve speeds and depths to find out where the fish are staging. The last lure you should have in your tackle bag is the spinnerbait. Spinnerbaits have been around for many years for good reason – they work. Use them when the water visibility is lower. The spinning blade causes under water vibrations that help fish locate the bait. A 3/8″ oz white Booyah spinnerbait is a great lure to start with. If you notice fish feeding on the surface, nothing beats the thrill of catching them using top water baits. One of the most popular top water lures is the whopper plopper. It’s very simple to use – cast it out, let the water calm down after the lures hits the surface, then start reeling. Often times you may have to add pauses or twitches, or vary the speed of the retrieve. There’s no mistaking when a fish hits a top water lure. Imagine you’re at your favorite lake and you’ve tried live bait and every lure in your bag and still can’t catch anything. It may be due to one simple reason – the fish aren’t there. Now imagine if you could see underwater and know for certain that fish are in the area. That’s what sonar devices can do for you. Wireless, castable fish finders are becoming more and more popular nowadays, and they’re an affordable electronics option for anglers getting started. I use a Deeper Smart Sonar. It’s pretty light, so if you’re not casting too far the your medium action rod and monofilament line will do fine. Then I just keep walking the bank and casting the Deeper system until I locate fish. The Deeper system also uses your phone’s GPS so you can keep track of locations you fish, with a great notes function on the app. I use this to log my catches and build m knowledge. In fact, they’re an amazing way to accelerate your learning curve when you’re getting started. You’ll be able to work out which structure your targets like, what depth they tend to be at in different temperatures, how their behaviour and location changes in different seasons. And knowing there's fish in the area can allow you to focus more on your bait/lure presentation and help you build confidence when trying new methods. The final item that is essential for the first time angler is a good bag to keep all this gear organized. Spiderwire offers a single shoulder bag that is big enough to hold all the items above and still be comfortable enough to carry around all day. It is important to be mobile as you may need to change spots often to chase the fish. You don’t want to have your hands full when walking up and down the river bank looking for the next bite.